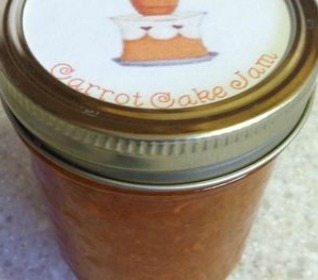 You are here: Home / Blog/News / Blog / Carrot Cake Jam…yes please! Sweetened with crushed pineapple and spices, this sunny fall jam tastes just like carrot cake. It makes a perfect gift for any occasion. SPRINKLE pectin evenly over bottom of Pot fitted with Stirrer. ADD carrots, pears, pineapple with juice, lemon juice, cinnamon, nutmeg, and cloves evenly over pectin. Add butter/margarine to help reduce foaming. PRESS jam button; cook time will automatically default to 21 minutes. Press enter. WAIT 4 minutes for appliance to sound 4 short beeps; add sugar gradually while Stirrer continues running. Place glass Lid on Pot. APPLIANCE continues to stir your ingredients while it cooks. Stay within earshot of appliance; when it beeps again at the end of the process, jam is complete. PRESS cancel, unplug appliance; immediately remove glass Lid. Remove Stirrer using a pot holder. Skim foam, if necessary from top of jar. PRESERVE jam immediately, using 1 of the 3 ways listed here.